Big Bands and the Music of Salut! Wine Co.
Our atmosphere at Salut! is often accented by the nostalgic and fun sounds of the Big Band era, plus other old-time Jazz greats. You can download much of this music free using the links below! So much time has passed that the era now represents a completely different world of music, separated by several generations. It was a time when top musicians had to group together to play to earn their keep, and only where people had to gather together to listen while they played it. Each hotel had a grand ballroom, where big bands would play and entertainment acts would perform. As the radio era grew, the local station would outfit the biggest local hotel ballroom with a remote microphone, to broadcast the performances to the town or through the NBC network to radio stations throughout the country. 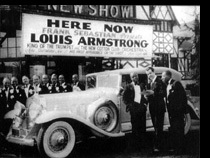 Many of the big band songs we hear today were lifted right from the recordings of those remote broadcasts. It’s debateable if the era was a more innocent time in America, but it definately conjurs up a time when you could understand the lyrics, wouldn’t be offended by them, and looked forward to hearing the music play! We hope we can generate some interest in this entertaining time in American music. Great stuff, David! Love these bygone days! Didn’t life seem simpler then??? ?